Full grain supple leather uppers with wrapped leather heel. 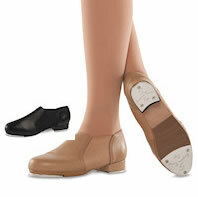 Two piece leather sole designed for flexibility and support. Elastic gore inserts that hug the foot for comfort and support. Super Tone Taps with adjustable tap system on leather sole. Rubber sole patch behind taps. 6-12 whole and half sizes - wide & medium width. Sizing Note: Order your regular USA street shoe size. Men order 2 sizes larger.